Bersin by Deloitte’s landmark High-Impact People Analytics study from 2017 found that companies with advanced capability in people analytics were three times more likely to have an organisational culture of data-driven decision making. 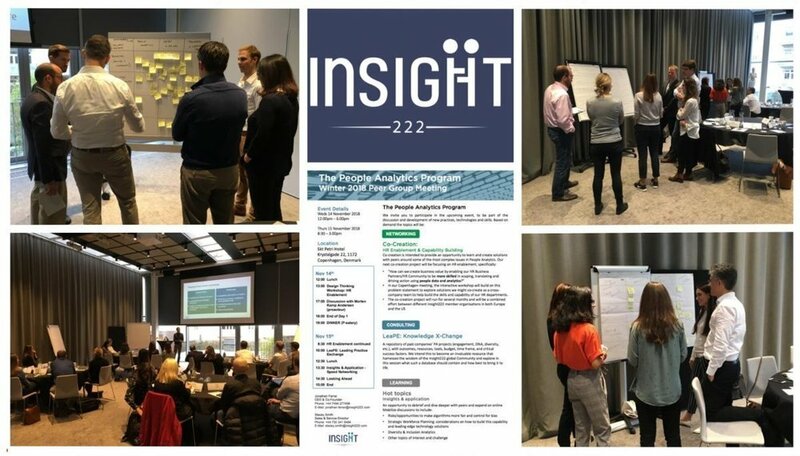 The European members of Insight222’s People Analytics Program recently convened in Copenhagen for their winter peer group meeting. 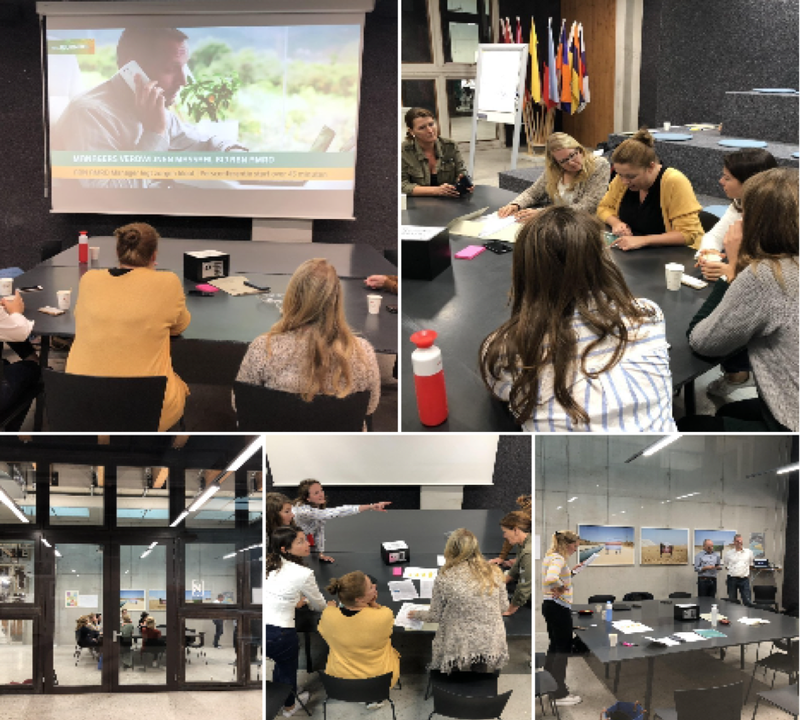 Much of the two-day agenda was devoted to a workshop to kick off a co-creation project to solve the following problem statement regarding the enablement of HR with people analytics. How can we create business value by enabling our HR Business Partners/HR Community to be more skilled in scoping, translating and driving action using people data and analytics? Over the course of the next few months, European and North American members of the People Analytics Program will collaborate to co-create a HR Enablement MVP together with Insight222. During the workshop, member organisations were invited to share examples of how they had sought to improve the data literacy of HR professionals and consequently imbue a fact-based culture of decision-making when it comes to people. 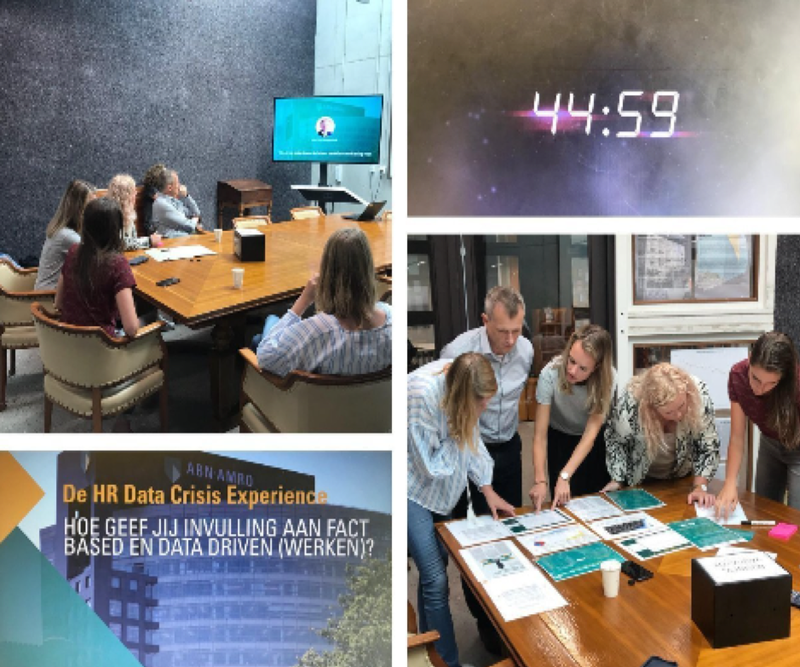 One particularly innovative idea was described by Jaap Veldkamp, Lead People Analytics at ABN AMRO and involved the creation of an Escape Room to support the learning of HR professionals at the bank. I caught up recently with Jaap and three of his colleagues at ABN Amro: Patrick Coolen (Global Head of People Analytics, Strategic Workforce Planning and HR Survey Management), Ingrid Bienefelt (Global Head of HR Quality) and Martijn Vosz (Management Information Specialist) to find out more. David: Please can you provide a brief summary of what the Escape Room entailed. Why did you decide to create it? What were the main objectives? Ingrid: We were looking for a way to promote and get colleagues enthusiastic for our important 'Must Win Battle’; Fact Based and Data Driven. As this doesn’t come naturally within the HR community we decided to do this in a fun way. The idea of a virtual escape room was born. The main objective was to trigger curiosity and make participants more aware of the topic and the urgency. Jaap: During the summer holidays, HR organised summer school days. All colleagues were asked whether they would like to arrange a training, lecture or workshop on a topic they thought would be interesting for our HR colleagues. This is a great way to share knowledge and improve important skills. The approach resulted in more than a dozen different workshops, facilitated by our own colleagues or external vendors. Patrick: We thought that this was a great opportunity for us to increase the awareness and benefits of working with a more fact-based approach. In our first meeting, we discussed if it would be nice to provide a lecture about our Fact-Based Maturity Wheel. We use this model to measure to what extent the different HR Departments are working in a fact-based way, as measured by six different categories. Whilst, the Summer School provided an opportunity to discuss the different maturity levels with our HR colleagues, we knew that nobody was likely to apply to join a theoretical lecture. Therefore, we decided that we must develop a workshop that was more fun, and we came up with an Escape Room. Martijn: In this Escape Room we tackle the most common mistakes people make when trying to be more fact based. These include thinking of n=1 issues, correlation versus causality, fake news, how to read graphs et cetera. We hope that, by letting people make these mistakes in a funny way in a safe environment, we raise awareness and their critical thinking. Jaap: To make sure people understood the different ‘takeaways’ we built into the game, we discussed them at the end of the Escape Room. To reinforce the message we also let participants know which HR departments can support them to continually improve their fact based skills. What was involved in setting up the Escape Room? Ingrid: We investigated several possibilities and options regarding how to incorporate the fun element. We ended up devising an out of the box and short and snappy game. Besides HR, we also invited the department ‘Chief Architect & Data Management’ (CADM) to help create the Escape Room and identify what the key takeaways should be. The development of the Escape Room itself was done with an external vendor FrisseBlikken. Once the Escape Room had been developed, we used a short clip of the intro video as a teaser to promote the game linked to our HR Summer School. How did the Escape Room work? What was the user experience like? Patrick: We had to find the right balance between fun and content. To make it simple, we divided the Escape Room into three parts, in which the beginning and end are mainly fun. The fun elements were the usual suspects, like a puzzle to open a safe, or having to find a password that is hidden somewhere in the room. In between, the game was mainly focussed on the correct use of data sources. We provided participants of the Escape Room with many different data sources, of which only three were valid to use. All the others should, from a fact-based perspective, be discarded and put aside. Martijn: To immediately enthuse participants in the Escape Room experience, we played a movie as soon as they entered the room. In this movie, you get some background information about the case, followed by a call from our CHRO explaining that he needs help in solving an urgent problem. The movie immediately causes a response and mobilises participants into action, providing the ideal start to the game. What was the feedback from participants? Jaap: Given that we work with data every day in the people analytics team, it would have been kind of ironic for us not to measure client satisfaction! So we did. On average the Escape Room received a client satisfaction score of 9.2 (out of 10), which we were of course delighted with. What have been the key benefits? Ingrid: The Escape Room has played an important role in supporting our brand messaging in HR for a fact-based Way of Working. It has helped to highlight to our HR colleagues that the work we do in the people analytics team is not boring, but instead fascinating and vital to the success of both our business and the experience of our employees. The Escape Room has created increased awareness and provided impetus to the start of a fact-based mind set. As we created and ran the Escape Room together with members of our people analytics team, it has also helped improve the visibility of our HR data quality team and what we do to the whole of HR. What were the key lessons you learnt? What advice would you give to companies considering a similar initiative? Martijn: Make sure you can have a big reach. Normally, you play an Escape Room with four to six people. But then it would take ages before the majority of HR played this game. In our game, 30 to 40 people can play at the same time. We achieved this by letting different teams compete against each other. Patrick: Already during the development phase, different business lines showed their interest and asked us whether they could use this game for their own capability building efforts. Since we were the primary customer, the storyline of the Escape Room is about an HR topic, but we made sure that the game was scalable and usable for other business lines as well. At this moment the game is being used by three different business lines in our organisation. Thanks to the ABN Amro team for sharing the story with myHRfuture readers. You can connect with Ingrid, Martijn and Jaap on LinkedIn. If you don’t already, I strongly recommend following Patrick on social media as he publishes one or two articles a year tracking the people analytics journey at the bank. You can connect with him on LinkedIn, follow him on Twitter and also read his HR Analytics curated page on Flipboard. As referenced in the introduction of the article, ABN Amro is a member of The People Analytics Program along with 50 other global organisations. The Program is run and facilitated by Insight222 and is designed to help member organisations create more impact with people analytics. Click on the links to find out more about Insight222 and The People Analytics Program. David is a globally respected writer, speaker, conference chair, and executive consultant on people analytics, data-driven HR and the future of work. He helps HR practitioners and organisations leverage data and analytical thinking to drive positive business outcomes, improved performance, and enhance employee experience. Prior to launching his own consultancy business and taking up board advisor roles at Insight222 and TrustSphere, David was the Global Director of People Analytics Solutions at IBM Watson Talent. As such, David has extensive experience in helping organisations embark upon and accelerate their people analytics journeys. David will be chairing and/or speaking about people analytics, data-driven HR and the Nine Dimensions for Excellence in People Analytics model at the following events in 2019. If you are going to one of these events and would like to meet up with David or you would like to book him to speak at a conference, please contact David by email on dgreen@zandel.org.